Stewart Pumpkin is about 12" tall not including his moon on a stick. 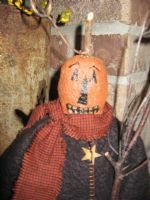 He has a paper clay head that has been painted with great pumpkin features. His coat is black woolfelt with an orange blanket stitch hand stitched around the edges & rusty tin stars stitched down the front. Stewarts moon is painted & stained wood and is perched on a bunch of sticks. 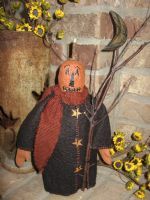 Stewart is a delightful Folk Art piece that will look fabulous in your fall decor!! $30.50. FREE SHIPPING IN 48 U.S. Others E-Mail me. I offer $$ off average shipping costs. (Because Stewart is hand made, no two faces or moons on sticks will be the same. Please keep this in mind when ordering. )STEWART IS ALSO AVAILABLE AS A PATTERN. CHECKOUT THE PATTERN SECTION.